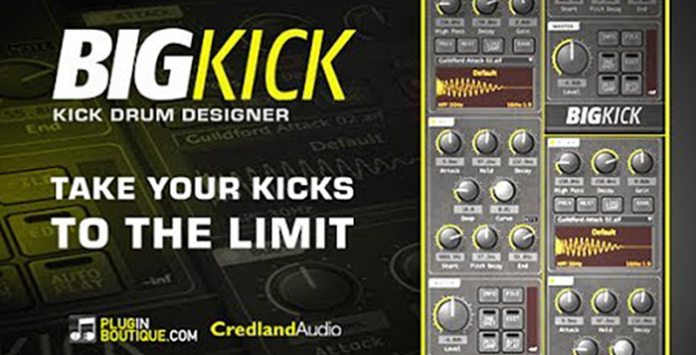 PluginBoutique have announced their first plugin release in collaboration with Credland Audio called BigKick. The drum kit is the rhythm and groove of any track and the kick drum is the heartbeat of the groove. We know how important it is to get the kick drum right in the mix. BigKick was created with the sole intention of allowing producers to achieve the results they have always wanted. We are hoping to get our hands on this beauty soon so keep your eyes out for a BassMusique review. You can check out a video of the features here. Hours have you spent searching through your sample libraries for kicks? Times have you layered several kick drums together and still not got the result you were after? Phase issues have you come across when layering kicks? Times have you wanted complete flexibility over the low end and attack of your kick? You can reuse your existing drum sample library. Incredibly useful instant drag-and-drop sample export: Get your attack, blend with the synth engine – drag straight from the plugin into your DAW arrange. Audialize, Cutline, Daniel Daly, D-Product, Freemasons, Jamie Anderson, Jim Credland, John Lead, Kris O’Neil, Niche Audio, Rasmus Faber and Timo Garcia. With some extra input from Nick Sentience. Click here for a free demo and to purchase.